Deputy Foreign Minister says Arab MKs, UNESCO should read the Bible and the [empty] book of Palestinian history. Deputy Foreign Minister Tzipi Hotovely (Likud) on Wednesday night spoke in the Knesset about UNESCO's recent decision to declare Hevron and the Cave of the Patriarchs (Mearat Hamachpelah) an "endangered" "Palestinian heritage" site. Speaking on behalf of the government to the Knesset's Arab MKs, Hotovely said, "You are thieves of history. Your history books are empty, and you are trying to co-opt Jewish history and Islamicize it." 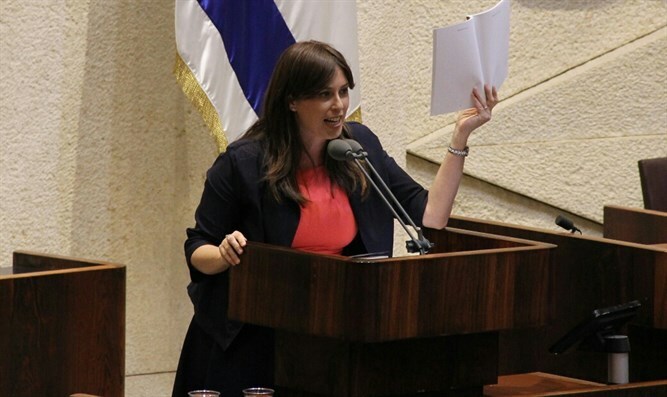 "What is happening here is a process of stealing Jewish history on the part of the Palestinians via international forums," Hotovely said. "I recommend to UNESCO and to the Arab Knesset members to read these two books, the Bible which tells the story of the Jewish people, and Assaf Voll's new bestseller, A History of the Palestinian People: From Ancient Times to the Modern Era." "It will captivate you because it is empty. Because the Palestinians don't have kings and they don't have heritage sites. "The Palestinians are appropriating Jewish heritage sites and displacing them, just as they are are trying to change the Western Wall into an Islamic site and just like they are attempting to sever the Jews' connection to the Temple Mount. "